Just when we were resigned to the prospect of drawing a blank yet again in our Odyssean quest for fine Hindi movies, comes along a delightful Bollywood aberration called Taare Zameen Par. With its offbeat and gripping story supported by fine performances from the key players, Taare Zameen Par is an easy movie to love. Taare Zameen Par is also Aamir Khan’s first shot at directing a movie. Though you wouldn’t know that given the outstanding execution. Over the years, we’ve been forced to temper our enthusiasm about Indian child actors. After all, it’s unrealistic to expect Indian kids to display any acting skills when most Bollywood grownups can’t act. But Taare Zameen Par surprises on this count too with an amazing performance by Darsheel Safary as a dyslectic kid. All kudos to Aamir for drawing out an exemplary performance from the young boy. Darsheel’s performance is on par -maybe a tad better – with what Ayesha Kapoor delivered as the young deaf and blind girl in Sanjay Leela Bhansali’s Black. Yes, Aamir Khan has an important role in the movie but it’s the little boy Darsheel’s film all the way. Shunned at school for his low grades, taunted by his classmates and belabored by his father, Ishan Awasthi (Darsheel Safary) turns into an intractable problem for his parents who pack him off to a boarding school hoping it’ll insill some discipline in him. But things get only worse at the new school for the young boy, who completely withdraws into a shell. Ishan is a problem at the new school too, that is, until a former dyslectic and temporary arts teacher Ram Shankar Nikumbh (Aamir Khan) awakens the school and Ishan’s parents to the boy’s condition. Sure, Taare Zameen Par is not in the same league as Rain Man, the Dustin Hoffman-Tom Cruise movie about an autistic man. But Taare Zameen Par is light years ahead of your average Bollywood flick that invariably has us in a curdling mix of nausea and rage at the end. If we have any gripes at all about Taare Zameen Par, it’s in the sheer number of songs. Taare Zameen Par proves that when it comes to quality Hindi movies, Aamir Khan is ahead not just of the other Khans – Shahrukh Khan and Salman Khan – but also the likes of Hrithik Roshan and Akshay Kumar. By golly, our Bollywood bozos have accomplished the near impossible – they have delivered aÂ top notchÂ Hindi movie in Taare Zameen Par. 12 Responses to "Taare Zameen Par – A Glorious Bollywood Aberration"
A glorious search India aberration of movie reviews! 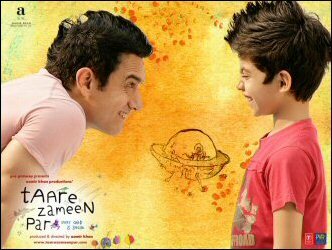 Frankly,what Taare Zameen Par needed was a good director to make it a true masterpiece. In story-telling, the ends do not justify the means. And when your story lasts 2Â½ hours, the means are the ends. Taare Zameen Par is a noble effort, messed up in narration. This was supposed to be the tale of a gifted teacher who helps a dyslexic kid work with this world and possibly even excel at it. There is, unfortunately, too much description of the problem, and too little of the solution. And that makes this one a triumph of show-off over substance â€“ the sequences showcasing the child’s disorder, if we may call it that, are admittedly well-written, but that appears the writers’ comfort zone. So it plods on and on â€“ Aamir Khan isn’t even there in the first half, and the movie self-indulgently shows scenes upon scenes and songs upon songs of the child’s life and his world-view. And when the real challenge, the resolution, presents itself, it’s glossed over simplistically: the cure to dyslexia is being gentle and appreciative. The film will certainly change the way a lot of parents who watch it bring up their children, it will increase sensitivity to the condition, and it might even result in increased enrolling in NGOs. However, this is still a feature film promising entertainment, a tale well told, and not a documentary. For starters, Mr. Nikumbh cries at the kid’s condition â€“ and once too many times â€“ and that affects your judgement of the film. Then, he puts too many fundas in a few sequences, which, in a movie that used subtlety right until then as the preferred mode of communication, juts out obliquely. And finally, the treatment of the condition, which you’d gone to the movie for, lasts less than 10 minutes, and has nothing innovative in it. The film, of course, has a fairy tale ending, which, in tales of triumph over human adversity, usually helps gloss over several sins. And it’s up to you to decide if that fairy-tale ending actually misses the point – so is the film finally about a gifted child who can win competitions? TZP showcases several pieces of good writing in the first half’s characterization of Ishaan. The songs are superbly written, rendered and shot. And the actors are almost all top-notch. Darsheel Safary delivers a great performance. The family and school scenes all stroke plenty of association or dÃ©jÃ vu. Well, if anything, TZP will certainly help you be a better parent. Apart from that, from a sheer cinematic point of view, one can describe Taare Zameen Par as an emotionally manipulative film. I am a massive Aamir Khan fan, so I’m quite biased when it comes to his films. All I have to say is thank god TZP was the last film I watched in 2007. It was good to end the year off on a high. I think I was still in disbelief after the shocker of a film, Om Shanti Om. Darsheel was awesome.. Aamir deserves praise there to have gotten something good out of him.. but Darsheel’s potential was not fully realized.. as araj said, it needed a better director.. along with a better screenplay and editting. We disagree. Definitely one of the better movies to emerge out of Bollywood’s sewers. Can we discern a kid’s full potential from his first movie itself…probably not. His acting seemed to be a bit histrionic (not sure if that’s the right word) in some places.. I don’t think it is his fault.. I am comparing his performances with Dakota Fanning and Abigail performances.. Dakota is probably more talented that many of the senior hollywood actresses.. but Abigail is not more talented than Darsheel, yet her performances seemed more natural. Are you aware of Ayesha Kapoor (of Black fame)? With the exception of Ayesha Kapoor (now a grown-up 14-year-old) and Darsheel, the rest of the child artistes in India are horrible to watch. Even the kids in Kuselan were awful. No, I have been wanting to watch Black in a long time.. Will watch it soon.. I don’t think the problem is with the child artistes..
1) Rich kids are made to concentrate on academics — Dreaming that TZP would change the parent’s outlook. 4) Even the talented kids fall into the hands of useless freaks.. Aamir Khan and the Black creator should be lauded for going through a good audition process and getting (almost) the best out of those kids. Kuselan was shot in 3 months, the audition process was probably from a bunch of kids in that same village the movie was shot in.. and it was probably completed in 1 day.. such is the incompetence or reluctance-to-make-good-movies of most Indian movie makers. pls review anjali (1990) too…. Netflix does not have Anjali. We’ll see if we can get it from the Indian stores here. (at the risk of sounding pedophilic), Shamili looks hot now. I think this posting machine doesn’t like when I post jpgs. In Gabriel Garcia Marquez’ last book Memories of My Melancholy Whores, the 90-year-old narrator is obsessed with a 14-year-old girl. oh well.. shamili must be atleast 17 or 18 in that pic.. RV Udhayakumar is also checking her out.. just short of drooling. (at the risk of sounding ignorant) Gabriel Garcia Marquez’ books are in Spanish or English? She looks like one of those hormone-fed milk cows. She’s probably in her early 20s….Anjali was released in 1990. Gabriel Garcia Marquez writes in Spanish but the books are translated into English. We are currently watching Love in the Time of Cholera (Javier Bardem) but it’s a pale shadow of the eponymous book. Have you watched Tingya? The unofficial marati entry for the Oscars? No…Netflix does not have it (presumably because it’s new and it’s Marathi…they have only Hindi and Tamil in the Indian section) and we are not sure if the movie made it to the U.S.
Looks interesting. Alas, Netflix does not have it.